The Wards Island Bridge is a pedestrian bridge connecting the East 103rd Street in Manhattan to Wards Island. The bridge is open year-round. This vertical-lift bridge has a total of twelve spans. Spans one through four are located on the Manhattan side of the bridge and are oriented from south to north. At span five the bridge turns from west to east. The curb-to-curb width of the lift span is 3.66m. The clear width of the Manhattan approach ramp is 3.66m and the clear width of the Wards Island approach ramp measures about 3.76m. The Wards Island Bridge underwent a $1.5 million rehabilitation, completed in early 2012. DOT upgraded the bridge deck, replaced the electrical system, and improved lighting and security. Third Avenue is a local City street, running north from the Bowery and Fourth Street in Manhattan to Webster Avenue in the Bronx. DOT has undertaken a $118 million project to replace the previous Third Avenue Bridge, which opened on August 1, 1898. It replaced an earlier obsolete iron swing bridge at the same site. The initial deck carried two trolley tracks, which were eliminated in 1928 during a reconstruction effort to accommodate automobiles. In the early 1900's, electric operating equipment replaced the original steam equipment. Major reconstruction in the mid-1950's reconfigured the bridge from four trusses (three deck sections) to three trusses with two roadways of two lanes each. During the same period a span was constructed over the Harlem River Drive with access to it, and several of the approaches were rebuilt. 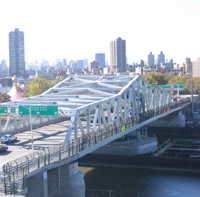 The Third Avenue Bridge carries traffic south from Third Avenue, East 135th Street, Bruckner Boulevard, and Lincoln Avenue in the Bronx, to East 128th Street, East 129th Street, Lexington Avenue, and the Harlem River Drive in Manhattan, traveling over the Metro-North Railroad Oak Point Link, the Harlem River, and Harlem River Drive. The main span over the Harlem River is a swing-type bridge. It is located about 750 meters south of the Madison Avenue Bridge and 600 meters northwest of the Willis Avenue Bridge. The project to replace the Third Avenue Bridge over the Harlem River is substantially complete and is in the process of being closed out. All five travel lanes are completely open to traffic and no further lane or bridge closures will be required. Both channels of the Harlem River through the work zone are also open for navigation. The contractor continues to demobilize from the work site, perform final cleanup, address remaining minor work items, and complete all documentation in preparation for Final Inspection and Acceptance of the project. DOT has resumed operations and maintenance of the swing span and mariners may continue to request a bridge opening in accordance with U.S. Coast Guard regulations. Madison Avenue is a local street, located between Fifth and Park Avenues on the east side of Manhattan. The road extends from 23rd Street in Manhattan to East 138th Street in the Bronx. The Madison Avenue Bridge is a four-lane, four-span swing bridge, carrying traffic between Madison and Fifth Avenues and East 138th Street in Manhattan and East 138th Street and Grand Concourse in the Bronx. The bridge is located approximately 650 m south of the 145th Street Bridge and about 750 m north of the Third Avenue Bridge. The bridge has two roadways, each 8.23 m wide, as well as two 2.743 m sidewalks. In 1874, residents in the vicinity asked for the construction of a bridge from 1 38th Street (then in Westchester) to Madison Avenue in New York, and funds were appropriated the following year. Due to the uneven topography and relatively undeveloped landscape, the proposed bridge required substantial pier and approach construction. The superstructure, composed of iron, was contracted to the Keystone Bridge Company in 1882. The swing bridge was opened in 1884 at a cost of $509,106. The area's growth quickly necessitated the construction of another, larger bridge. The current bridge opened on July 18, 1910, at a cost of $1,155,987. 145th Street is a four-lane local City street in Manhattan and the Bronx. The bridge connects West 145th Street and Lenox Avenue in Manhattan with East 149th Street and River Avenue in the Bronx. The location of the bridge is approximately 1,250m south of the Macombs Dam Bridge and 650m north of the Madison Avenue Bridge. 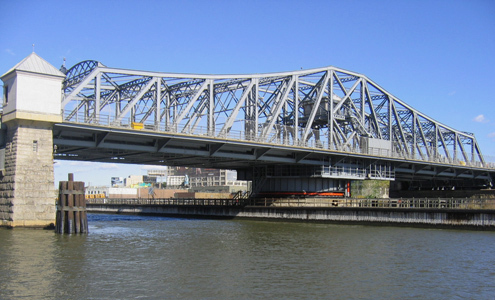 The 145th Street Bridge is a swing type bridge with three through-trusses. It is an eight-span structure carrying four lanes of vehicular traffic over the Harlem River Drive, the Harlem River, and Metro-North Railroad. 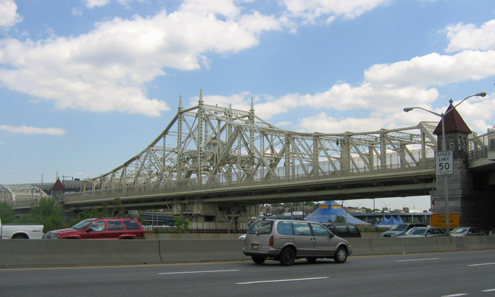 Spans 1 and 2 were constructed in 1957 when the bridge was extended to span the Harlem River Drive. Spans 6, 7 and 8 were reconstructed in 1990 in place of the original Bronx flanking span to provide a right-of-way for the Oak Point Link. The bridge carries four 3.6m lanes, two in each direction, plus a 2.7m sidewalk on each side of the bridge. The west and east approach roadways are 17m and 41m wide, respectively. Towards the end of the 19th century, rapid growth in the vicinity created the need for an additional Harlem River crossing. The initial design of the bridge, by Alfred P. Boller working for the architectural firm of Messrs Clinton and Russell, was based on the recently built Macombs Dam Bridge, but was modified to accommodate an expected growth in travel across the river. The bridge was delayed due to the construction of an IRT subway tunnel under one pier, and finally opened in 1905. The construction firm was Rodgers, McMullen, & McBean, and the cost was $2,742,139. The bridge was entirely closed to traffic on November 1, 2006 and the center swing span was removed. Following the removal of the existing swing span and reconstruction of the center pier, the new swing span was floated into place, connecting the Bronx spans with the Manhattan spans, on February 9, 2007. DOT reopened one lane in each direction and the north sidewalk on March 22, 2007. After being assembled off-site, the new bridge was floated down the Hudson River, around the tip of lower Manhattan, up the East River and was moored near the recently reconstructed Third Avenue Bridge. 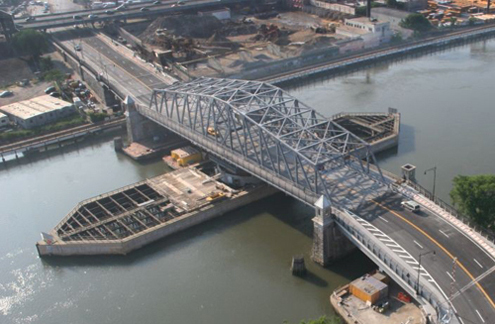 In February 2007, when the preparatory work was complete, the new 145th Street Bridge was floated up the Harlem River to its final destination. The reconstructed bridge includes a new swing span, new machinery and an electrical system, a new approach roadway and spans, railing, fencing, lighting, and signals. A new Operator's House has been centered and installed. Download a detailed description of the project (pdf). The site of the present bridge was originally occupied by a single-draw, wooden trestle footbridge, erected in 1891 and removed soon afterward. The current bridge opened at its new location in 1908 and cost $1,182,782; as the old Broadway Bridge was being replaced, it was floated downstream to begiven a new life as the University Heights Bridge. The bridge allowed access to the Fordham Landing, and eliminated the grade crossing at Fordham Landing Road. Shortly after the opening, railroad tracks were added and the operating machinery's steam-powered motor was replaced by an electric one. The swing span was replaced by a new one in 1992. Broadway extends from the southern tip of Manhattan, through the Bronx, and terminates in Westchester County. The Broadway Bridge, a lift type, is located between West 220th Street in Manhattan and West 225th Street in the Bronx. Three tracks of the IRT subway are carried on its upper deck, and a four-lane two-way roadway with sidewalks on either side is carried on its lower deck. The two roadways each measure 10.36m and the sidewalks are 1.83m wide. The first bridge at this approximate site, a then-shallow spot where the waters of the Harlem River and Spuyten Duyvil Creek joined, was built in 1693 and was known as the "Kings Bridge," as everyone except soldiers and other representatives of the king had to pay tolls to use it. The construction of the alternative "Free Bridge" by merchants and farmers in 1758 was considered a significant revolutionary act. Both the Kings and Free Bridges had draws to admit small craft. The Free Bridge was built of dry rubble and wooden beams, and was destroyed by the British when they routed Washington's troops from New York in 1776; it was rebuilt shortly after the war. In the late 19th century, the dredging and widening of the river and development on both sides created the need for a new bridge. Alfred P. Boller designed a single-deck steel swing bridge, which opened in 1895. Within years the original span had to be replaced by a double-deck swing span to accommodate the extension of the subway, and the old one was floated downstream to become the University Heights Bridge. The double-deck swing span in turn was replaced by a double-deck lift span in 1960.